The Anchorage mayor and School Board elections are coming up. Here are the candidates. Ethan Berkowitz and Rebecca Logan. 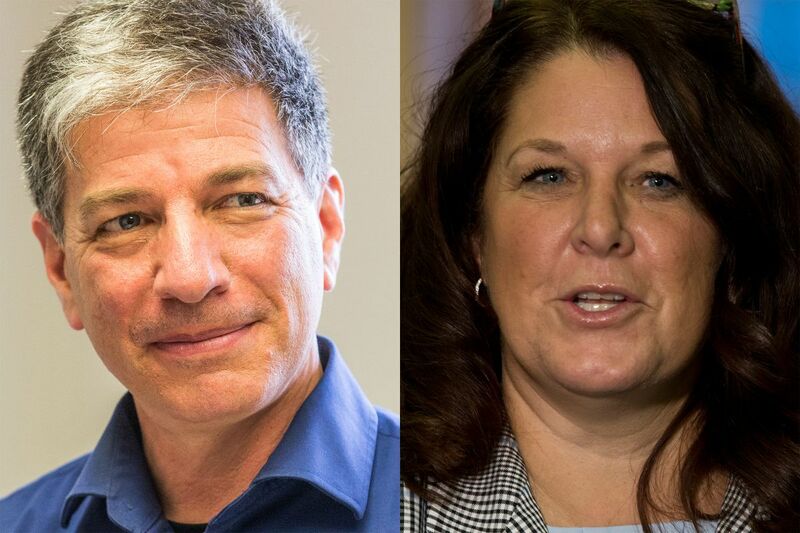 The Anchorage mayor's race is shaping up to be a two-way contest between incumbent Mayor Ethan Berkowitz and challenger Rebecca Logan, an oil, gas and mining industry group manager who has the support of the Alaska Republican Party. Candidate registration closed Friday for mayor and for three Anchorage School Board seats. Voting starts in just five weeks — the city is holding its first mail-ballot election this year. Logan, the general manager of the Alaska Support Industry Alliance, an oil, gas and mining association, has been fundraising since fall and has gained support from Republicans, though the race is technically nonpartisan. Berkowitz, a registered Democrat and former state representative, was elected in 2015 on a platform oriented around public safety, education and business development. He is seeking a second three-year term. Other candidates include Dustin Darden, a city maintenance worker and perennial political candidate; Timothy Huit, who owns a roofing business and ran for mayor in 2015; and Paul Kendall, another perennial candidate who has called for the state capital to be moved to Anchorage. Ron Stafford, Matthew Mendonsa, Nelson Godoy and Jacob Kern also filed as candidates. Meanwhile, nine people have filed for three Anchorage School Board seats. Board members are elected in municipality-wide, nonpartisan races. The most crowded race is School Board Seat E, where five candidates filed. Don Smith, a former member of the School Board, declared his candidacy a day before the filing deadline. Tasha Hotch, Alisha Hilde and David Nees, who have all previously sought School Board seats, also filed. Stafford, who registered as a mayoral candidate, also registered as a candidate for Seat E.
In a last-minute swap, Tam Agosti-Gisler, the current president of the School Board, dropped out as a candidate for Seat F.
Deena Mitchell, a founder of Great Alaska Schools, a parent education advocacy organization, took Agosti-Gisler's place. Mitchell had previously filed to run for a different school board seat, Seat G.
In a letter to board members Friday, which was also provided to the Daily News, Agosti-Gisler said she plans to move with her husband to his home country of Switzerland after he retires in March. Agosti-Gisler has served two terms on the School Board, and made it a full-time job, supported by her husband, she said. With his retirement, she said, she plans to teach English in Switzerland. She said she and her husband expect to move back to Anchorage after two years, and she may run again for School Board in a future year. Mitchell said in a phone interview that Agosti-Gisler had called her Friday morning, the day of the filing deadline, to say she had decided not to run for a third term, and that she wanted Mitchell to take her place. The two had worked together closely in recent years, Mitchell said. "I wasn't going to say no to that," Mitchell said. She and Agosti-Gisler came to the city's Election Center on Ship Creek about 4:40 p.m., just 20 minutes before the filing deadline, said city clerk Barbara Jones. Mitchell will now compete against Phil Isley for Seat F.
Mitchell had previously sought to challenge incumbent Elisa Snelling for Seat G. Snelling will now compete in a two-way race against Irene Weisman. There are no Assembly races in 2018. Voting in the election starts Tuesday, March 13, when elections officials mail out ballots to registered Anchorage voters. Ballots can be mailed back, dropped off in drop boxes or cast in-person at several accessible vote centers. The last day to vote is Tuesday, April 3.